So, if you are wondering why everyone is going crazy over the new movie Black Panther, and Avengers: Infinity War, looking to air February and May of 2018 let’s back things up a bit and tell you all some facts. For starters, make no mistake when I accentuate, Black Panther is the very first superhero from African descent to ever touch mainstream American comics. But it gets even more interesting if you ask me. You see Black Panther was originally created by two talented gentlemen by the names of Stan Lee and Jack Kirby. Two men raised in New York by their Romanian, and Austrian Jewish Immigrant parents. These gentlemen changed superheroes as we knew them forever when birthing Black Panther in 1966 during the silver age of comic books first appearing in fantastic four #52 in July. Black Panther is T’Challa, King, and protector of fictional African Nation of Wakanda. Now, before I go further into a few more facts regarding T’Challa, I would love to talk about the significance of his tittle Black Panther. I really love how it was meticulously thought out. Black Panther was originally going to be named Coal Tiger but was changed to Black Panther in the early 1960s as we previously discussed. However, what I could not seem to overlook was the Black Panther Party that had been established around the same time the Black Panther superheroes name was officially established. For a quick briefing, The Black Panther party was originally a party that patrolled neighborhoods in Oakland, California to protect against police brutality, founded by Huey Newton, and Bobby Seale in 1966, the same year Black Panther T’Challa was birthed. See a pattern here? I also find it symbolic that Black Panther protects the Wakandans in a similar way, except from a lot more than just police brutality. Now I am not exactly sure if Stan Lee or Jack Kirby had purposely made that his tittle to create a symbolic message, however, regardless it is pure brilliance and to be appreciated in history for many years to come. Especially when such a character was birthed in a time so much racial controversy was taking place, and the Civil Rights Movement. The time so many leaders had taking a stance in changing history such as Martin Luther King Jr, Malcom X, Robert Weaver, Constance Baker Motley, Stockley Carmichael, Duke Ellington, and so many others after. So, if you did not understand the bold and brave stance these gentlemen took in creating such a superhero, I hope you do now. Now let’s fast forward to some more interesting information. With black Panther leading the way as number one. Soon to follow after were other African American superheroes such as Falcon (1969), DC Comics John Stewart in the role of Green Lantern (1971), and not to mention Luke Cage (1972), and many more after. 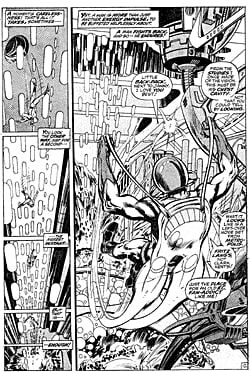 The Black Panther went through thirteen issues of Jungle action, issues six through eighteen, which was considered Marvel’s first graphic novel. Black Panther is a strong character and his powers are but not limited to: strength, genius intellect, strategist, skilled hunter, tracker, expert martial arts, enhanced velocity, agility, stamina, durability, healing capabilities, and pristine reflexes. He has protection against spiritual attacks, and a high-tech suite made of vibranium. Sound familiar? That is because it is the same material Captain America’s shield is made of, and only found in the land of Wakanda. T’Challa was also said to have married and divorced our contemporary superhero Storm from X-Men. Not to mention he has a sister Shuri whom plays the role of Black Panther during a period he had to heal from injuries. Chadwick Boseman has been the first to portray Black Panther in Captain America’s film Civil War in 2016. So, believe me when I say Black Panther and Avengers: Infinity War being released February and May of 2018 will be epic, and by far another step toward changing history where the thought and birthing of T’challa began in the early 1960s of July and still breaking barriers well into 2018. That is huge! Not only does this movie excite many African Americans releasing itself in black history month making a bold statement around the world accentuating everything that Black Panther superhero symbolizes, it should excite all that are for constant optimistic change and equality. Subliminally teaching African culture and what it looks like in a uplifting light and not what media likes frequently portray. Now you see, this incredible super hero is not just an action packed fad dressed in black prancing on your screens with no real purpose. He represents the mark of change in history. Showing African culture that they not only matter, but they are just as magical and exotic as they want to be. Dripping and oozing with royalty and strength running through T'Challa's veins raising the standards and esteems of all African American children around the world that did not know they could be as significant too. A superhero that finally looks like one of them. Someone they too can relate to culturally. A superhero that has the ability to strike more prosperity in black culture through strength, unity, and intelligence. Before you go sleeping on this hero's significance, make sure you think twice before you do. Ladies and gentlemen, now is a good of time as any to release Black Panther, King of Wakanda, T’Challa. Embracing and adding more beautiful culture to the melting pot. I am first a writer, and a woman of many trades. I love theater and inspiring others in one way or another, even if it's just by simply being myself. Check it out where it all happens on my Blog. arionalynn.com Go on this journey with me.